Gordon has now moved to Yorkshire so its not just so far to come back to Scotland. The team entered the Scottish rally which would be the first event in Scotland for 5 years. The event started from Lockerbie Lorry Park and we away nice and early at 8:15 in the morning. The weather had been very dry in the lead up to the event so a lot of dust was expected. The first stage was Twiglees and we made a steady start as this was the first rally for 7 months. No real problems but every now and again we would get caught in a dust cloud as there was very little wind and it was struggling to clear in some sections. The stage was also quite loose which made it quite a challenge to go in a straight line. At the end we were 16th fastest which was respectable if unspectacular. Stage 2 was Castle Oer just across the road. Dust was again likely to be a problem, however the car in front of us had gone off at the second junction and the car in front of him had gone off at junction 3. This meant we had a 3 minute gap to the car in front and visibility was perfect. We were able to push on the stage and it was all going well until a 90 left hand bend and the back end of the car came round too quick and the car spun and stalled. It took a while to get going as we had to get the car started and then do a 3 point turn so probably 30 seconds or so lost. Shortly after we came into a right hand junction and Gordon misheard the note and set the car up for going left. So another small spin and 10 seconds lost. Only 25th quickest through the stage dropping us to 18th overall. We then had a regroup and then back to Twiglees for a second run through. The wind had picked up and the dust was clearing much quicker so it didn’t cause any problems on this run. All was going well until about 3 miles from the end. We were going over a particularly rough patch and trying to keep the car neat and tidy however when trying to dodge a big rock the car stepped sideways and we punctured a rear tyre. That made things difficult for the last section as we could only go half speed along the straights due to the unpredictable handling. 22nd quickest was all we could manage. Stage 4 was another run through Castle Oer. It was over almost as soon as it began. The driveshaft broke off the start line and we decided to park up at the next junction. Once all the cars had gone through we rejoined in front of the closing car and made it out and then back to service. The plan was to get it repaired and complete the last 2 stages. However once back in service we discovered it was too badly damaged and couldn’t be repaired. Unfortunate to end the rally like that but it was enjoyable while it lasted. Thanks to Brian and David for helping out with the servicing. 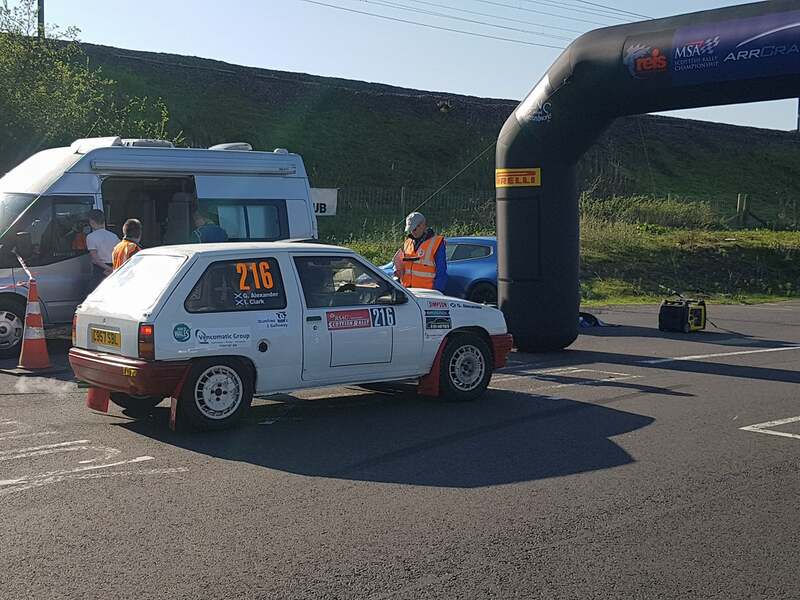 This entry was posted in Rally Reports by Ian. Bookmark the permalink.